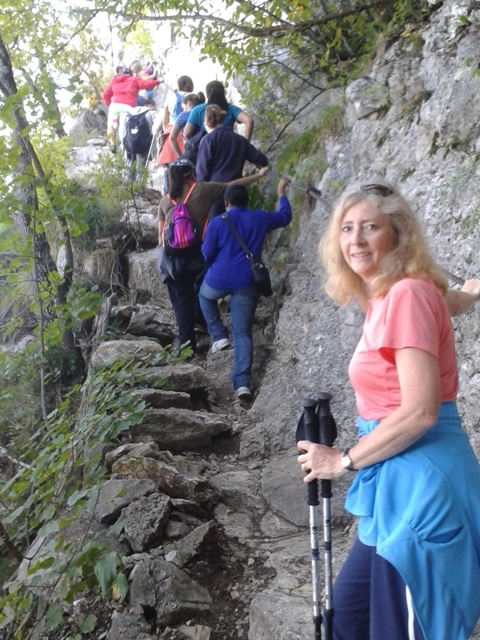 The Salève, yes we hiked to the top, and yes it is that far. These life lessons seem to be coming fast and furious. Today’s life lesson was: When you start to think you are pretty hot stuff, be careful, a humbling experience is coming. Now for the story that goes along with that particular life lesson. Today was the school picnic. 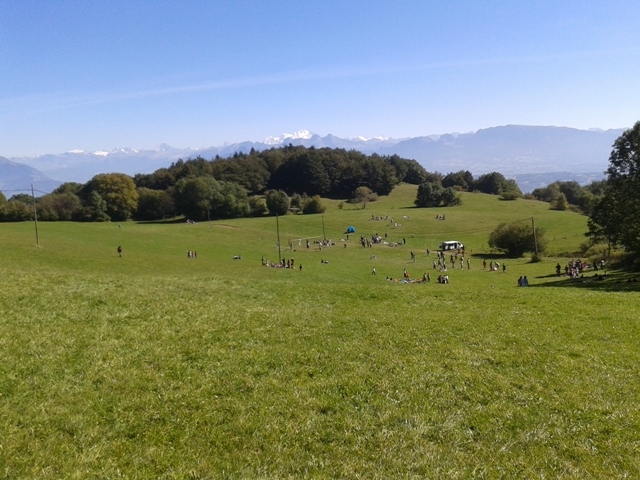 As you can see in the pictures, Campus Adventiste de Salève does not have it’s school picnics just anywhere. 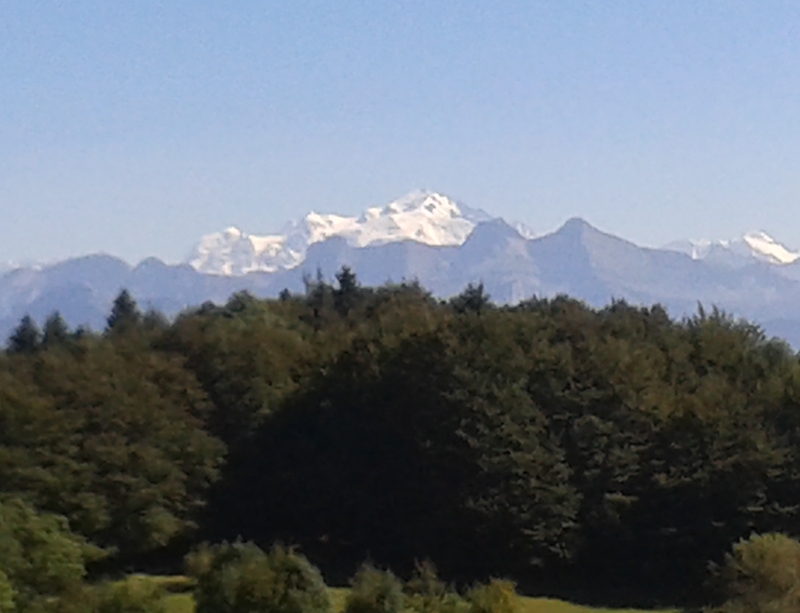 No it is on the top of a mountain, in a green field with a backdrop of the French Alps and in particular Mont Blanc. And yes it is more beautiful than the pictures can show. 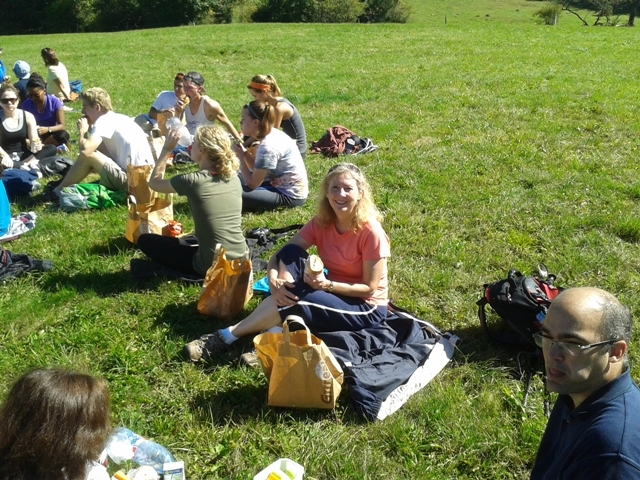 However, to get to said picnic ground, one has to hike up the Salève. For those of you from Tillamook, think King Mountain, without the relatively flat part at the beginning. For those of you not familiar with King Mountain, think Pike’s Peak with a slightly lower elevation. Now Bekki and I have been walking up and down the hill to school each day, 1 or usually 2 miles each day, and we were pretty proud of ourselves. Each day we noticed we could do it faster and were not as winded when we reached the cafeteria. So we were ready for today’s little hike. Our view of Switzerland from about 2/3 of the way up. For those of you who think you know where this story is going, we made it to the top without assistance and without supplemental oxygen, and we were not the last ones to the top either (although almost last). The humbling part is as follows. We were making our way up the mountain, resting as needed (read frequently) and thinking we were doing pretty good when this guy comes flying down the mountain. Now I have to assume that he went up the mountain earlier this morning and was now headed back down. That still was not the humbling part, this guy was on crutches on one leg! For real! 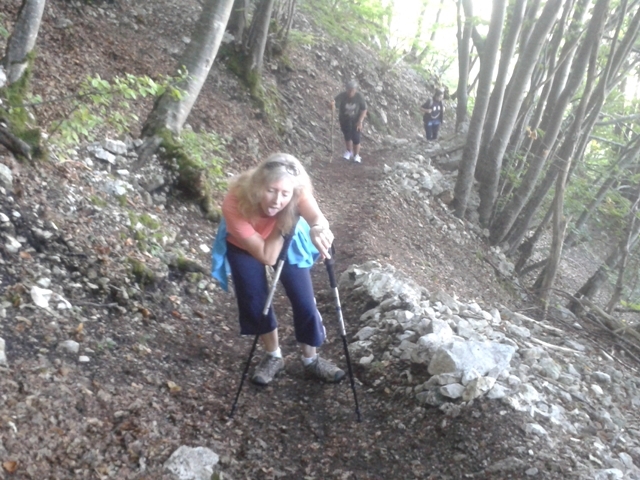 This trail is steep, narrow and winding, with drop-off that would make…well they are steep. Granted he did not have a backpack on, but still, on crutches? We rode down in a car with one of our teachers. Bekki looking better, as we climb higher. Notice the steep drop off to the left, and the narrow stairs. Now this is where one should have the school picnic. Despite the humbling experience it was a great day. 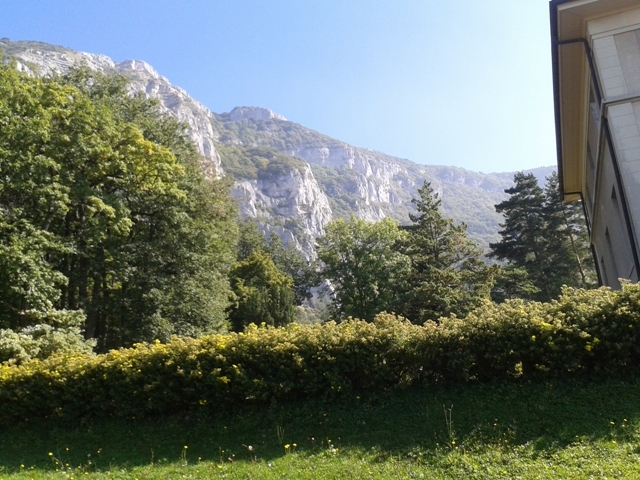 The views were magnificent, the food was good, and we got to meet some new people and got to know our teachers better, and got to practice French all day. I hope you enjoy the pictures. 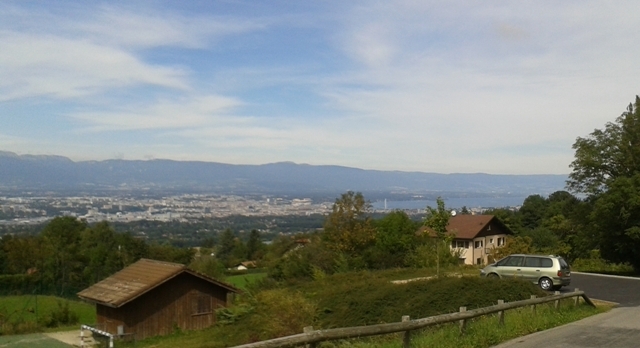 The view of Geneva and the lake from the Campus Adventist du Saleve. Life lesson #463. When you have a chance to volunteer, take it, because you may be chosen to do something more difficult later. That is just the present tense, then there is the past tense, the imperfect past tense, the future tense, the future conditional tense, and so on. We had no idea language was so complicated. Anyway, Gosia (the teacher), put a couple of verbs on the board and asked for volunteers to conjugate them. Well the first couple she put on the board were actually pretty easy, but did I raise my hand and volunteer? Of course not, there was no way I was going to look stupid in front of a bunch of college students. By the way, most of the ones in my class are French majors and have had multiple years of French and are really serious about this. So how did I end up in that class? Simple, I am a good guesser. Seriously, I have always scored much better on tests than my actual knowledge. And apparently it was the same thing on the placement test. It was really hard but I was able to guess well enough to end up with all these French majors. So back to Friday’s class. There I am sitting on my hands, trying to be as inconspicuous as you can be in a class of 11, when Gosia asks me (read, “tells me”) to come up and conjugate “descendre”. An “re” verb, my least favorite, arghh. And of course my brain decides it is the perfect time to go out for lunch, so I am immediately brain dead. I could not have conjugated English verbs at that moment. So I slink up to the board and hope and pray that my brain revives. Fortunately it does, and somehow I get it right (I didn’t let Allison down). But the point is that if I had volunteered on one of the easier verbs I would not have had to sweat so much. So we are here at Collognes, and back in school. We have lots more sympathy now for students carrying heavy backpacks around, and eating cafeteria food (not that it is bad, just not home cooking) and being away from home. That being said, it is great here. We love Europe anyway, and this is a beautiful corner of it. As you can see from the pictures we look east over Lake Geneva and the city of Geneva, and west to the Saleve, the mountain that we are sitting on. 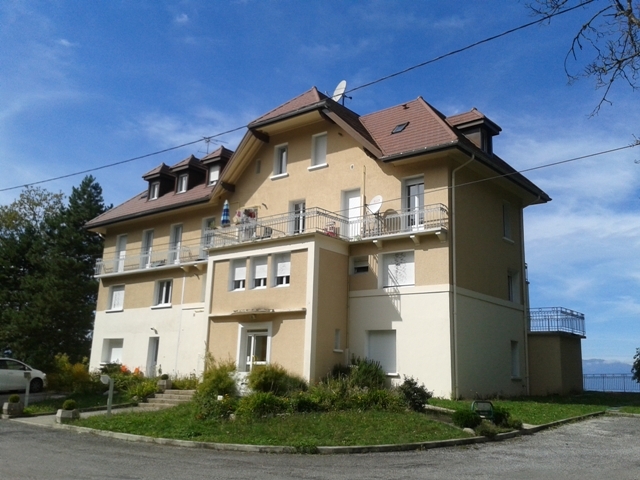 The town of Collognes is a delightful little burg, with neat, tidy, well cared for homes. Some homes are new and some are old. And the best thing is school comes with a built in exercise program. We asked for an apartment, which we got, but it is a 5 or 6 minute hike through the woods up to the cafeteria. The key word in that last sentence is “up”. Nothing is flat here, it is either up or down. So we go up to school and down to our apartment, actually down to the apartment building and up 3 flights of stairs to our actual apartment. We already are feeling more in shape than we have for a long time. Which is good because tomorrow the entire school (K-Grad school) is going on a school picnic. 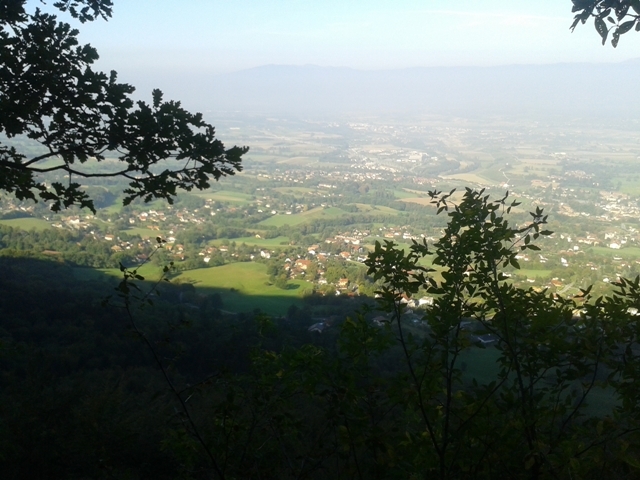 A hike up the Saleve. It should be beautiful, and we are ready (I hope). Beau Site, our home for now. We are in the top floor on the right. The floor above the balcony. I would tell you about all the sightseeing we are doing, but, well, sightseeing is limited to between pages 25-46 of my grammar book and pages 113-132 of my written and oral expression book. So for now that is about it. Oh I am getting reacquainted with the “My Bible Friends” books because that is the level of French I can read at for now. It does seem a little strange to be checking books out of a University library that are meant for second graders. 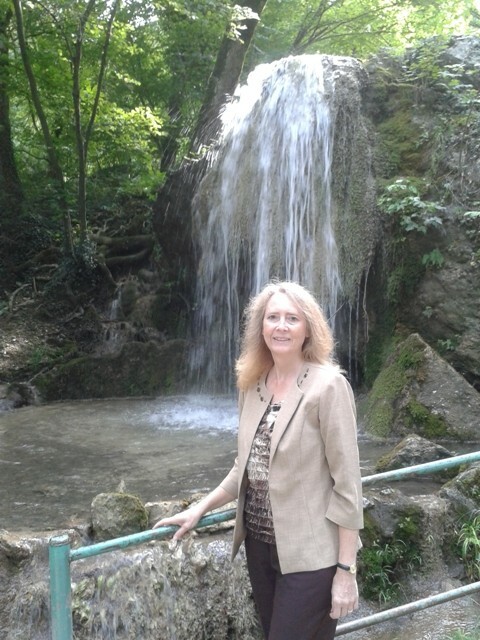 Bekki by the little waterfall we go by everyday (several times) on our way to school. December 12 does not seem very far away, especially when I think about how much I need to learn. So please pray for us that God will give us the gift of tongues at our advanced age. 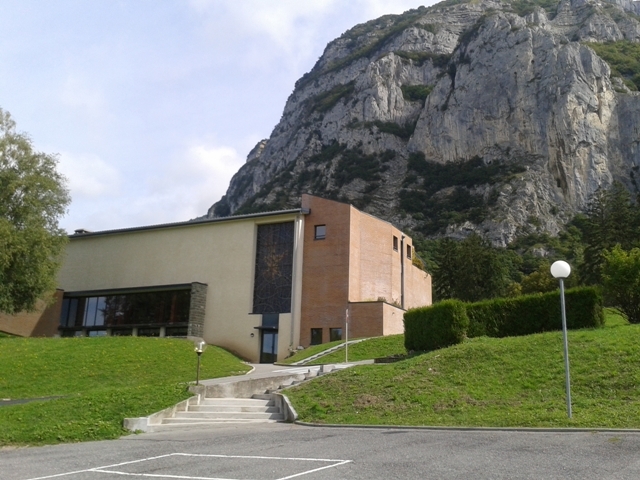 The campus church with the Saleve behind it. We go to the top tomorrow. 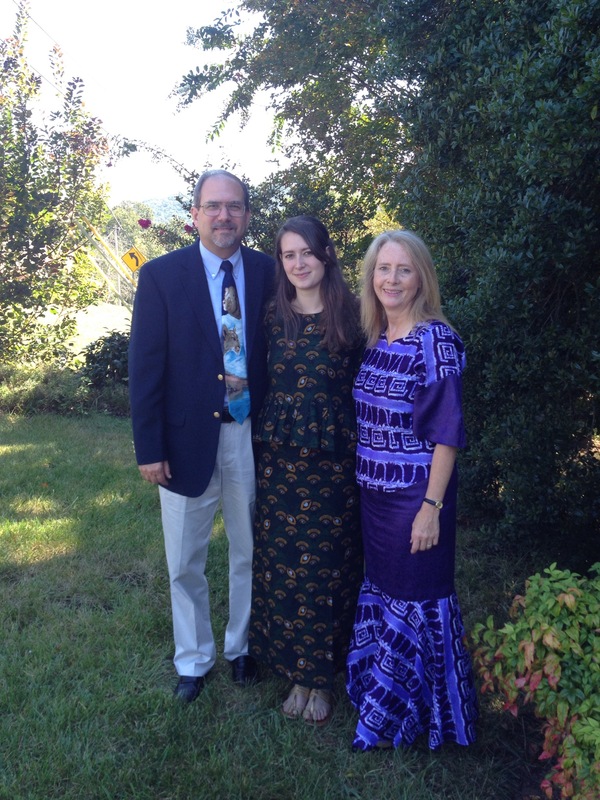 September 14 with our beloved Lindsay after church. Jon is in Israel, but with us in spirit. It is early Sunday morning, September 15. In the words of that old song from my generation, all our bags are packed, we are ready to go, we are leaving on a jet plane. It was exactly one year ago that Dad passed away and we received our call from the GC. What a year it has been. And now the time has come to go. What a kaleidoscope of emotions. I was telling Bekki last night that I don’t ever remember a time when I have been so conflicted, excited and terrified, happy and sad, full of eager anticipation and full of dread, watching the minutes tick by on the clock, sometimes too fast, sometimes too slow. It just depends on the moment as to which emotion holds sway. 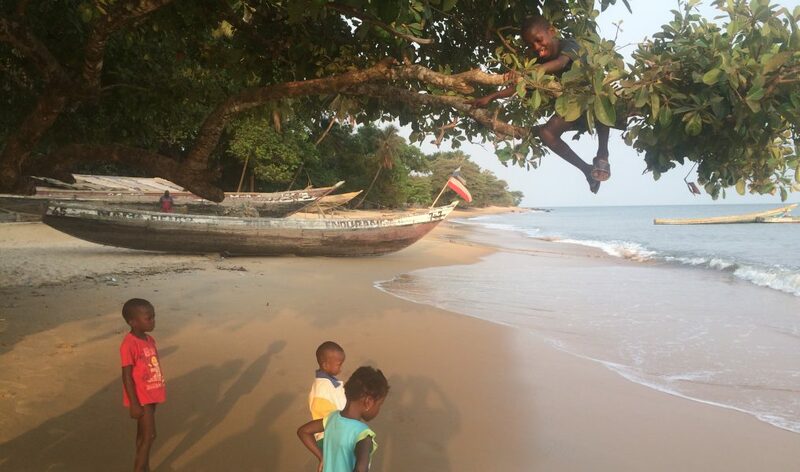 But no matter what in six and a half hours we will be on a plane for the first leg of our journey. No that is not right, it is not the first leg, it is the next leg. And although we were called by the GC a year ago, God has been preparing us for this for a lot longer. Even when we lived in Tillamook He was working with us, teaching us how to ride dirt bikes in terrain very similar to Koza. He changed our thinking and attitudes on mission trips, leading us to expand our horizons and start experiencing the joy of working for Him in other lands. 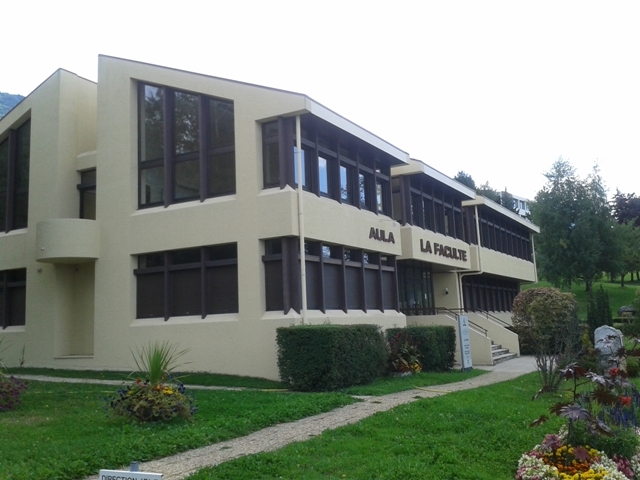 Then in Clarkston He got us together with Allison Hayes, our French teacher, so we go to Collognes with a solid background in French. And this last year He has led us to many wonderful people who have helped guide us and equip us for this work. Even this last week, when I was in Florida at the Ultrasound course (which was fantastic) he led a US Army Colonel to sit by me. As we talked I found out that his unit is going to Cameroon this winter for a two month training mission. He was able to give me invaluable contact information for the US mission there, which may come in very useful someday. Our Sabbath School lesson yesterday was on “Revival and Our Thoughts”, the teacher used that background to emphasize our need to keep our eyes on Jesus. I wondered how we keep our eyes on Someone we can’t even see and it occurred to me that we do it by focusing our thoughts on Him. When discouragement and fear come we think about Jesus and what He has done for us in our individual lives, how He has led and guided and cared for us, and what He promises to do for us in the future. And when things go badly, or at least not as we would wish them to (such as the house not selling) we can remember that this earth is not our home and in the context of eternity our time here is just a speck. So although I wish I had two more years to prepare (6 months OB-Gyn rotation, 3 months Internal medicine, 3 month tropical medicine course, and a full year to learn French), I will study as hard as I can the next three months. And then I will go to Cameroon on December 12 confident that God has called us to do this, and that He will make up any deficiencies. And when my courage flags and depression sets in, I will look to Jesus and remember what He did for me 2000 years ago, 2 years ago, 2 months ago, 2 days ago, and even 2 minutes ago.